While my laundry room wasn't terrible looking by any means, it just wasn't really working for me. The single wire shelf was great for hanging clothes to dry but it wasn't practical storage wise. I keep cleaning supplies here and my parents' pool clothes, not to mention laundry supplies. The paint color was ok, but since all of the other rooms are now various shades of neutral colors, this one stood out a quite a bit and no longer went with the vibe of the house. Here is a before picture--complete with a pair of pants hanging to dry (hey I keep it real here). And here is the after picture. Much better. Wouldn't you agree? Here's what I did to make this transformation happen. And all for a little less than $150! The pickled cabinets from the previous post were sanded and given a nice coat of white paint to match the base trim in the room. I spray painted the cabinet hinges a silver metallic with spray paint I borrowed from my parents. 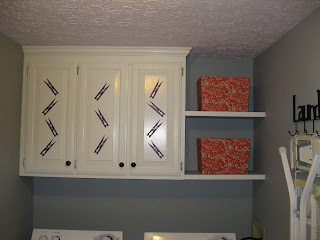 The cabinets didn't go all the way across the laundry room, so that problem was solved by installing floating shelves and placing decorative baskets on them. The idea was mine, but the installation of the shelves was accomplished by my awesome parents. The floating shelves are actually made from of a hollow core door purchased at the local Habitat for Humanity Restore for $3. (If you'll recall there were actually two sets of upper cabinets but both of them would have been too large to fit in the space so we just used the larger of the two and improvised.) I repainted the room a dark grayish-blue. The ceiling I painted a light purple. The clothes pins on the door fronts are from etsy and the purple glass knobs on the doors are from the Hobby Lobby. I even got creative and hung my ironing board on a "Laundry" sign from Hobby Lobby. I'll be completely honest-I'm not that happy with the wall color. I have visions of light silver walls and purple accents in here. The current wall color is just too dark. This grayish-blue is actually the second repainting of the room. The first gray I chose had too much green in it. I was almost finished painting the room when I said, "WAIT! I don't like this color, I've got to repaint it or I'm not going to be happy." So a quick run to Lowe's later and this is the color I came back with. This will have do for now as I'm not up for a third repainting. YET. Not to mention I haven't found the right silver for my "vision". For a grand total of $126. Love the redo! I need to do this too, so maybe I'll be inspired by your laundry room! Found you via Debbie Doo's newbie party and now a new follower!